As our flyer indicates, we are also going to be open every other Friday throughout the summer. So come pick up a few books to take to the beach, a vacation cottage, your backyard or wherever you like to kick back and read. Real books from a real bookstore – because it feels good!! 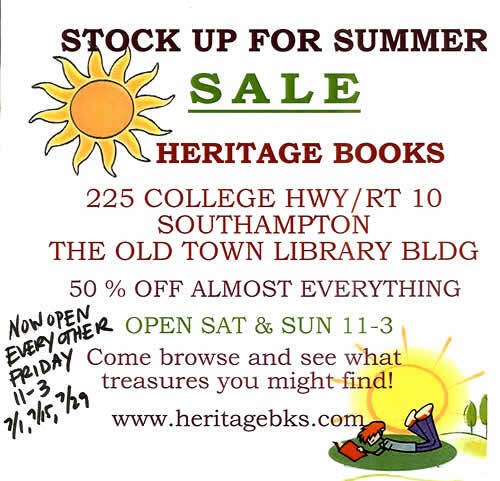 Selling very good books and ephemera, paperbacks to collectibles with everything in between, at very good prices. This entry was posted in books, bookstore, ephemera, sale and tagged books, bookshop, bookstore, collectible, ephemera, independent, local, rare, reading, sale, scarce, southampton, vintage, western massachsuetts. Bookmark the permalink.